Early this morning, Nokia announced that they have finalized their agreement with Accenture, a global consulting and outsourcing company. The deal, which was initially announced in April, will include the transfer of 2,800 Nokia employees from Finland, China, India, the U.S., and the U.K. to Accenture. Those employees, along with Accenture's existing staff, will manage the continuing development and support for the Symbian operating system through 2016. Marty Cole, CEO of Accenture's Communications and High Tech group, offered the following: "We look forward to partnering with Nokia as they continue to support Symbian and transition to the Windows Phone ecosystem." In addition to managing Symbian, Accenture will become the 'preferred supplier' for Nokia's Windows Phone transition. Accenture will use their newly acquired staff to expand their mobile software development, and contribute to the improvement of Windows Phone. Don't feel bad for those Nokia employees that are getting relocated. Nokia says they will still be a part of the Nokia master plan: "As we move our primary smartphone platform to Windows Phone, we will look to explore potential opportunities to tap this talent pool as they develop and expand their knowledge and capabilities beyond Symbian." It's looking like the end of an era, folks...but not quite yet. Wish GOD will open the eyes of Elop to see how successful the N9 and meego will be. NOKIA, its time for you celebrate your BIG COME BACK TO THE TOP!!!!!!!! And I think GOD needs to open YOUR eyes. Just because some phone manufacturer (which has a very shady history btw) just made a phone with a new OS doesn't mean it will cause to it to have a "BIG COME BACK TO THE TOP". It even won't necessarily cause them to be successful.There is nothing revolutionary about MeeGo. Nothing. In fact I'm sure that as we speak, Android developers are already developing a launcher that replicates MeeGo's functionality - 3 Home screens, one with apps, one that shows recent and active apps, one which shows all your social feeds.Oh wait. There is this company that's called Sony Ericsson that has exactly that (and a whole lot more) on it's eXperia phones. All that's missing is putting them together, and having swipe gestures - which is easily done in Android afaik.If you are a Nokia fanboy (which I guess you are judging from your misplaced optimisim) - I pity you. Your company is dead as major competitor in the market - and it was dead ever since 2007. And no new device with outdated hardware and non-original software is ever going to change that. The only thing that will do now for Nokia is WP7 - and then it will finally become a small time player - like it should be - fighting for market share with Samsung, LG and HTC. All of which btw also have Android as well. Very strange but expected fanboy reaction. Totally agree with ilia1986...It took them 18 months to develop 3 screens OS: 1. Grid of symbian icons; 2. Notification screen 3. Recently used apps And after 3 months we will have ICE CREAM Sandwich. Nokia have a strong position here in Eastern Europe and Asia, they are still considered from average people as "the Mercedes of phones", and that is the only thing that is keeping them on the market. Well, there is still hope for Nokia. Elop is truly a man who made a difference, now time will show wether for good or bad. Look at all the Nokia haters popping out everywhere! Especially ilia! Still got an ax to grind with Nokia, eh? You would think you would move on to troll an iphone article something. MeeGo looks great. IOS(which you seem to love so much)has stolen so much from so many,especially with its latest iteration. There is nothing original about IOS whatsoever. Let's give Nokia a chance, shall we? 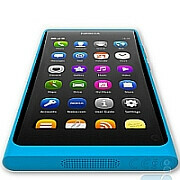 Who knows, the N9 may really take off, considering industry buzz around it.